The Low-Down: After more than a decade of back-and-forth, Avatar director James Cameron passes the helm of Yukito Kishiro’s manga adaptation to Sin City director Robert Rodriguez, while maintaining screenplay control. Alita: Battle Angel blends spectacular CGI and live-action with cyberpunk anime in a way never seen before on the big screen and presents one of the best uses of 3D battle sequences. 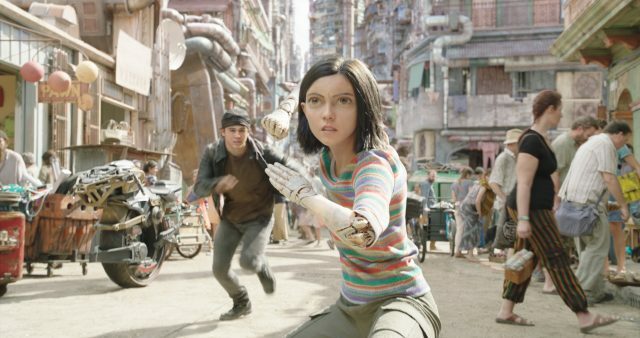 The Story: Cybernetics doctor Ido (Christoph Waltz) stumbles upon a cyborg girl head (Rosa Salazar) during one of his junkyard scavenges and repairs her back at his humble laboratory-home, naming her after his late daughter, Alita. Unsatisfied with her new-found life, Alita uncovers bits and pieces of her dark past as she fights off her adversaries supported by Ido’s ex-wife and robot surgeon, Chiren (Jennifer Connelly) and her new lover, Vector (Mahershala Ali). All the while, Alita engages in a romance with Hugo (Keean Johnson) that feels plucked out from a typical young adult novel. The Good: Without a doubt, the visuals are breathtaking. From the remnants of skyscrapers and gloomy Bladerunner 2049-esque streets of the Iron City to the cyborg bodies and their elaborate weapons and augments, you can see the thought put into every design. Above all, the blending of live action and CGI to form the phenomenal action setpieces alone is worth every dollar of your ticket. Beneath the spectacle, there’s a warm message to all with disabilities (physically or mentally) who feel they’re lesser than human, to embrace their bodies and their identities. The Not-So-Good: Much of the movie relies heavily on the viewers’ acceptance of what the narrative throws at them, which has many intrinsic problems of intentionally leaving out details for clunky expositions later on. Alita doesn’t make much out of Connelly and Ali’s presence too, as their characters only serve as accessories to Alita’s heroic journey. Even her love interest, Hugo, is more robotic than human and makes the worst decisions any sensible human wouldn’t. Knock-Out Sequences: Every time Alita leaps into battle, it’s near flawless action choreography meshed with top-notch CGI. In particular, the first Motorball match Alita watches with Hugo where heavily-augmented cyborg participants engage in a gladiator-like race reminiscent of Death Race, sets the bar pretty high. Fortunately, Alita one-ups with several jaw-dropping setpieces later that should compensate for the mediocre storytelling. Watch Out For: Alita’s first tryout at the Motorball preliminary rounds. It’s just an excuse to flaunt what the crew is capable of, but boy is it a blast. Recommended? Heck yeah. This is no Avatar, neither is it up there with Cameron and Rodriguez’s best works, but it is a brilliant collaboration. It might also be Hollywood’s best adaptation of a manga/anime yet. Watch this in 3D or 3D IMAX for the best experience possible. 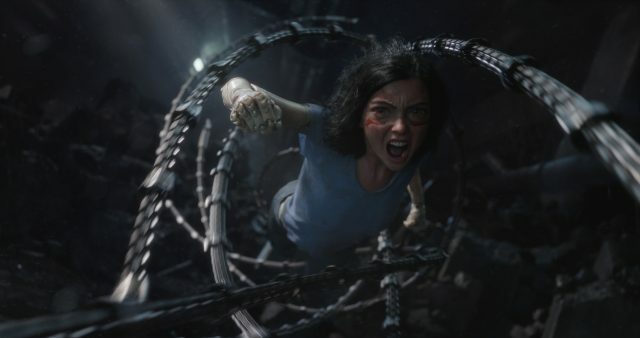 Critics and moviegoers alike are praising Alita for its excellent use of 3D.